WASHINGTON — Opposition to the Trump administration's plan to expand offshore drilling is mounting as Democrats from coastal states accuse President Donald Trump of punishing states with Democratic leaders and a second Republican governor asks to withdraw his state from the plan. Democrats said Trump and Interior Secretary Ryan Zinke were being hypocritical by agreeing to a request by Florida's Republican governor to withdraw from the drilling plan, but not making the same accommodation to states with Democratic governors. Democratic Rep. Adam Schiff of California said on Twitter that his state, "like Florida, has hundreds of miles of beautiful coastline and a governor who wants to keep it that way. Or is that not enough for blue states?" "If local voices matter why haven't they excluded Virginia?" asked Sen. Tim Kaine, D-Va. "Is it because the governor of Florida is a Republican and the Virginia governor is a Democrat?" The complaints came as South Carolina's Republican governor said Wednesday he is seeking an exemption from the proposed drilling expansion, a move that will test the relationship between Trump and one of his earliest supporters. Gov. 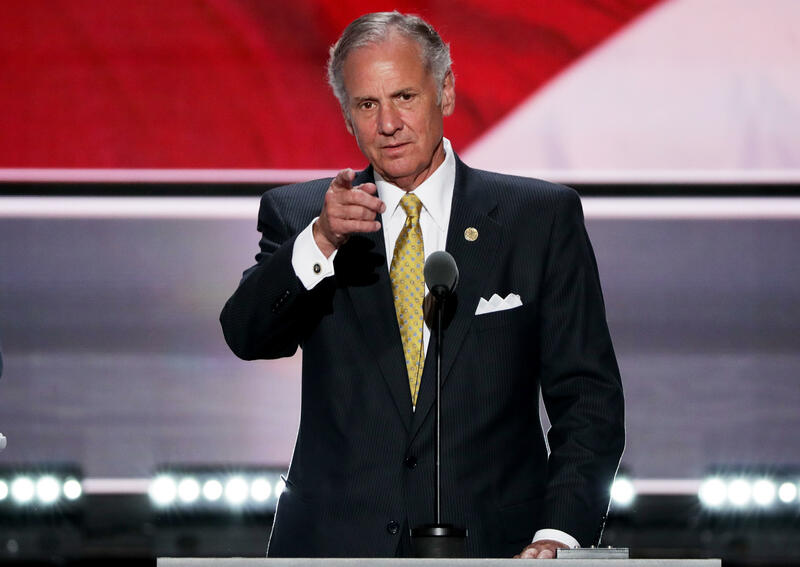 Henry McMaster told reporters that risks associated with drilling pose a serious threat to South Carolina's lush coastline and $20 billion tourism industry. "We cannot afford to take a chance with the beauty, the majesty and the economic value and vitality of our wonderful coastline in South Carolina," McMaster said. Opposition to drilling is bipartisan within South Carolina's congressional delegation: All three House members who represent the state's 190 miles of coastline told The Associated Press they are against the expansion plan. Two of the three are Republicans, including Rep. Mark Sanford, a former governor who said Zinke had set a precedent by honoring Florida's request for an exemption. "What's good for the goose is good for the gander," Sanford said, adding that Republicans should respect local wishes. In Virginia, GOP Rep. Scott Taylor joined Kaine and Gov.-elect Ralph Northam in opposing the drilling plan. Sen. Mark Warner, D-Va., called Trump's plan "a complete non-starter." Sen. Jeff Merkley, D-Ore., said on Twitter that "the only science @SecretaryZinke follows is political science. He'll reverse course to protect fellow Republicans in Florida, but not to protect coastlines and jobs across the rest of the country? Totally unacceptable." "The secretary has said since day one that he is interested in the local voice. If those governors would like to request meetings with the secretary, they are absolutely welcome to do so," she said. "Their criticism is empty pandering." As of Wednesday, only McMaster and Democratic Gov. Roy Cooper of North Carolina had requested a meeting with Zinke on offshore drilling, Swift said. In Oregon, Democratic Gov. Kate Brown took to Twitter to ask Zinke for relief. Linking to Zinke tweet about Florida, Brown wrote: "Hey @secretaryzinke, how about doing the same for #Oregon?" Zinke said after a brief meeting with Gov. Rick Scott, R-Fla., at the Tallahassee airport Tuesday that drilling in Florida waters would be "off the table," despite a plan that proposed drilling in the Eastern Gulf of Mexico and the Atlantic Ocean off Florida. The change of course — just five days after Zinke announced the offshore drilling plan — highlights the political importance of Florida, where Trump narrowly won the state's 29 electoral votes in the 2016 election and has encouraged Scott to run for Senate. The state is also important economically, with a multibillion-dollar tourism business built on sunshine and miles of white sandy beaches. And Florida is where Trump has a winter home in Palm Beach. Trump spent his Christmas and New Year's break at his Mar-a-Lago resort. Former White House ethics chief Walter Shaub said Zinke's decision to exempt Florida from the drilling plan appears to be a conflict of interest for Trump. Trump is "exempting the state that is home to the festering cankerous conflict of interest that the administration likes to call the 'Winter White House' and none of the other affected states," Shaub tweeted. Zinke said Tuesday that "Florida is obviously unique" and that the decision to remove the state came after meetings and discussion with Scott, a Trump ally and a likely candidate for the Senate seat now held by Democrat Bill Nelson. Nelson called Scott's meeting with Zinke "a political stunt" and said Scott has long wanted to drill off Florida's coast, despite his recent opposition. Scott's office said he repeatedly voiced his opposition to drilling to Zinke, including at an October meeting in Washington. "Senator Nelson and anyone else who opposes oil drilling off Florida's coast should be happy the governor was able to secure this commitment. This isn't about politics. This is good policy for Florida," said John Tupps, a Scott spokesman. Democratic governors along both coasts unanimously oppose drilling, as do a number of Republican governors, including McMaster, Maryland Gov. Larry Hogan and Massachusetts Gov. Charles Baker. The five-year plan announced by Zinke would open 90 percent of the nation's offshore reserves to development by private companies. Industry groups praised the announcement, while environmental groups denounced the plan, saying it would impose "severe and unacceptable harm" to America's oceans, coastal economies, public health and marine life.